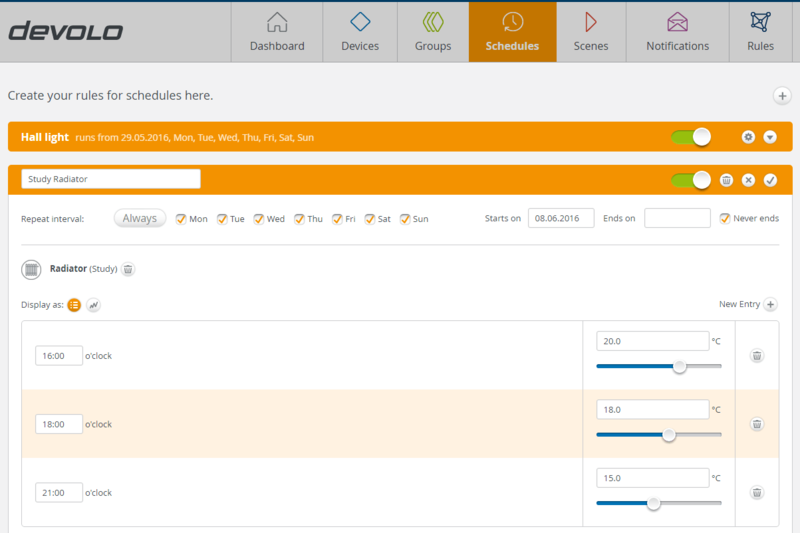 Welcome to the fourth part in our Devolo Home Control system. In this instalment we are going to review the heating control components, a TRV replacement actuator and a wall mounted thermostat. This area of application should be one of the easier ones to justify in a smart home. It can increase your comfort levels with a tailored heating profile which in turn should save you money on fuel costs. These savings will be even more significant if you have minimal heating controls to start with. An added bonus will be the reduction in CO2. A wet heating system will typically use a central energy source such as a gas, oil or biomass boiler to heat water which is pumped around a series of emitters such as radiators. There are two key elements of control that we will look at in the next section, how to control energy generation and its distribution. Energy is generated by firing the boiler. This is typically achieved by a time switch and / or central thermostat. This will consecutively bring in a pump and / or open values that will push water around the system. 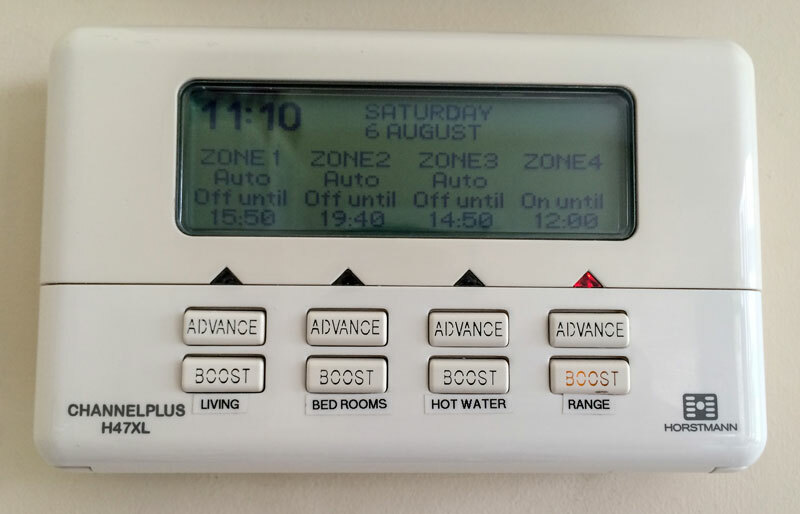 Our test property is fitted with a 4 zone time clock which switches 3 valves, 2 for a living and bedroom zone each with its own thermostat and domestic hot water with a cylinder thermostat. The 4th zone controls a Rayburn range for cooking. The Devolo Thermostat (Art No: 9507) RRP £79.99, is designed to replace a regular wall thermostat. The principle is exactly the same as a traditional one, it tells the boiler when to come on or when to move a control valve on a zone or to control a set of radiators. The Home Control app then replaces the time switch element. 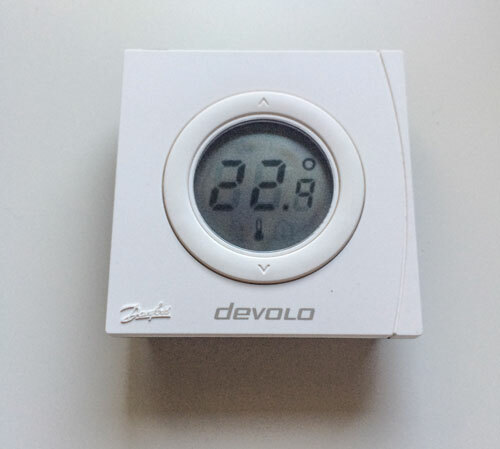 The Thermostat is branded as Devolo but will be familiar to some readers as the Z-Wave Danfoss Temperature Sensor. Devolo like others have taken a tried and tested design and incorporated it into their range. Adding the device was simple and a well illustrated process. Once on the network the device was placed in the study and it was reporting temperature. 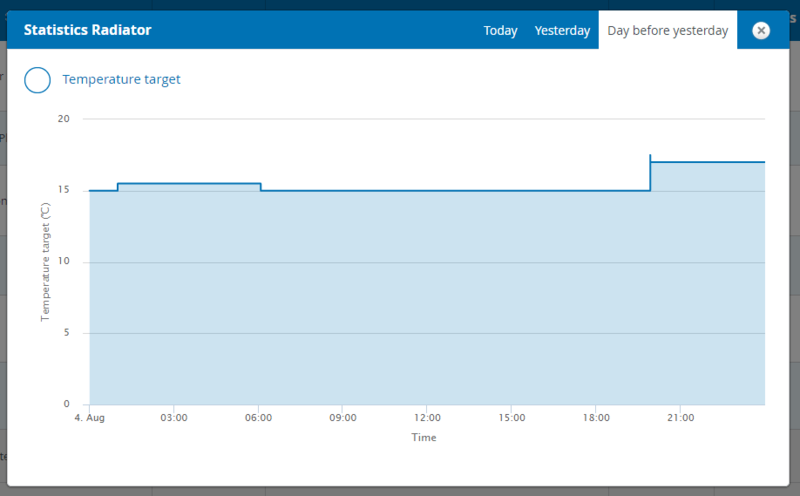 Similar to other Devolo devices you have access to the past 3 days history via a graph. In our opinion there is a missing link in the Devolo range of heating components and that is the link to the boiler. Something needs to tell the boiler to come on or go off. There are Z-Wave devices and relays available on the market that will do this key step in the process. This is a fundamental gap, without this you will have to rely on the existing heating controls and then only apply your smart home rules within that operational criteria. The energy is then emitted when the radiator releases heat to the surroundings. Traditionally this was a fixed flow through radiators or zones. 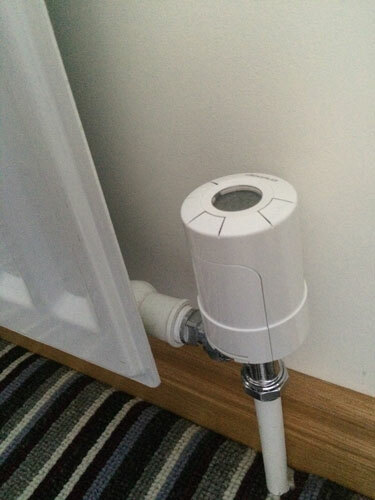 The introduction of Thermostatic Radiator Valves changed this approach. A TRV is a simple device that responds to its local temperature and actuates a plunger in the valve body, this is similar to you manually screwing a normal valve open or closed. The Devolo Radiator Thermostat (Art No: 9502) RRP £59.99, is designed to replace an existing TRV actuator. It comes with a set of adapter rings to fit the common valve types. Rather than relying on the expansion of a material in the TRV it uses a small motor to depress the valve pin. This pin pushes a valve inside the body to reduce or increase the flow of hot water. If the room is up to temperature the valve closes to stop the flow of hot water. If the room is not at its target temperature the valve will open to allow hot water to flow. Again this is not a Devolo piece of equipment, it is based on the Danfoss Living Connect LC-13. This design has been around for some time and there is no shortage of information about its performance. Joining it to the Home Connect hub was the easy experience we’ve now come to expect from Devolo. The two AA batteries required for power are included and fitting it to the radiator was easy, our test house valves were all fitted within the last 6 years and were the standard thread size so fitted without any adopters. The device clamps itself in position by determining the travel distance of the pin. Initially it feels loose but once clamped in position it is very solid. The device has three buttons on top and a small LCD screen. Temperature Up, Down and the Setup button. Without any app it is still possible for the user to change the temperature of the radiator. The set point will show on the backlit LCD screen. We set up a schedule to keep the heat off in the mornings and only to heat the room in the evenings between 4:30 and 21:00. 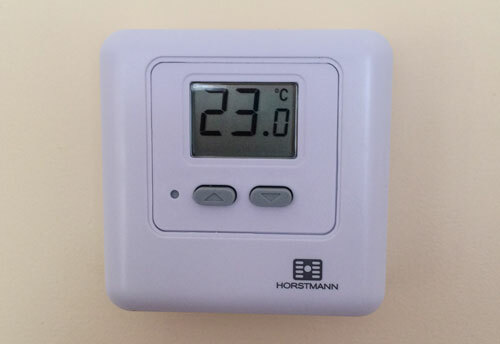 The Valve does not report temperature back to the Home Control hub, only the target temperature. This always struck us as unusual as the device must be able to measure temperature to adjust the valve opening position to achieve the target temperature. For actual room temperature you will have to rely on another sensor. One thing we have noticed is the battery life. In the 6 weeks since fitting the batteries are down at 82%. At that rate of usage they will only last around 8 months. Devolo have launched some parts of a smart heating system. These are based on tried and tested components manufactured by Danfoss. They sit reliably on the Home Control network but in our opinion, they are only part of a solution. Devolo have stiff competition in this field when compared to Heat Genius who take similar components but have developed a sophisticated smart app to make maximum use of the modules, for example weather compensation and intelligent learning schedules. Their system uses the same parts but offers control of domestic hot water and boiler control. We feel Devolo should develop a number of complete packages i.e. Total heating control and energy management. These deep value added technical solutions should ensure they are not another brand of the same components on the shelf. The components join the network with ease and work reliably. The app and software system will get very busy if you have devices in every room. The absence of a boiler switch limits the ability to create a 100% Devolo solution. The Radiator Thermostat batteries will definitely not last 2 years, perhaps one year with luck. If you want to know the actual room temperature then you will need to add another device, the Radiator Valve will only report target value. There are other smarter solutions available but if you want basic control then this may be for you. In our final installment we will see how the Home Control system works with other manufacturers devices. We will also summarise our verdict of the Devolo Home Control system. 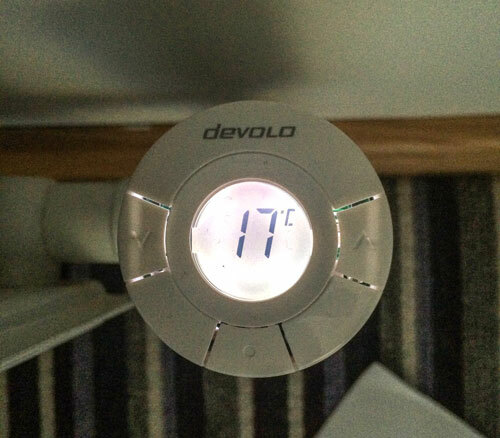 5 Comments on "Devolo Home Control Review Part 4 – Smart Home Heating"
I can only agree, the lack of boiler integration is a vast oversight by Devolo, spoiling an otherwise competent and efficient heating system. At the moment I’m running seven radiators, two in the lounge connected to a room thermostat (Danfoss) and using the top button to operate as a boost switch for the bathroom radiator ( this boosts the heating for ninety minutes when needed). So far all is well and gets the financial controllers approval (very important). I can only hope that Devolo has boiler control in the pipeline along with some sort of weather compensation linked to the weather report in the app. (This would also need to be updated more frequently to be of use). As an aside support have told me that an Amazon Echo skill is in development, but no date yet. Enjoying the reviews, thanks for taking the time. I agree this is a good solution for those who are looking for basic control. I added a 2nd relay inside a devolo smart plug then wired the volt free relay contact across the relay in my boiler timer control unit so now have boiler integration. 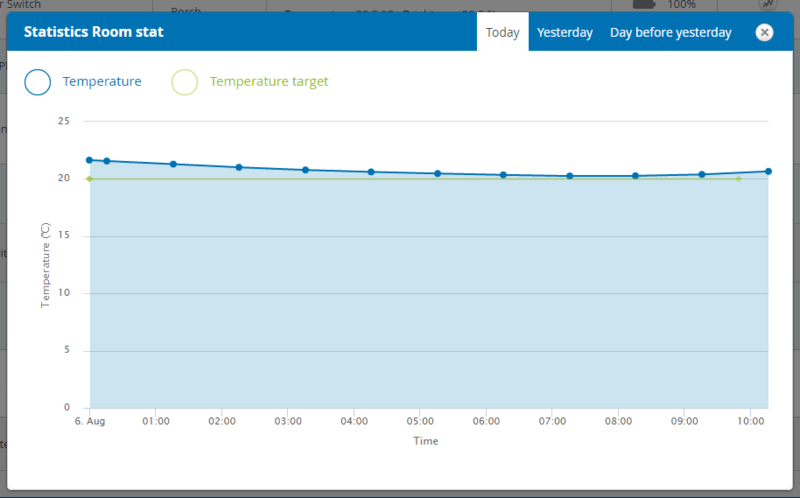 First thing I did was create some schedules to shut down the radiators at night, and then a added a rule so if all the rads are detected to go below 5degC target then the smart plug is tripped and the boiler shuts down. Likewise, if any radiator is detected to go above 5degC either manually or scheduled then the boiler is turned on. I added an MCO-Home boiler control unit and paired with the Home Control unit. It is possible to set the boiler control to Manual and back and effect the Set Points. I would live to know if you can use the Danfoss branded devices with Home Control as well or whether you only get he best functionality with the Devolo branded ones. I didn’t take the Devolo Home Contol heating any further as I didnt think the software would develop much beyond the basic configuration and the price of the hardware for a full implementation would have been prohibitive. This system has its shortcomings too judging by the feedback but fingers crossed it has worked ok for me and has been affordable.